Patty the rabbit was found on Friday, October 26, 2017 near the Woodcrest PATCO station in Cherry Hill. The couple who rescued it from the side of a busy highway decided a week later they couldn't give her up. The sun was setting near the Woodcrest PATCO Station last Friday when Rachel Kirk’s attention was drawn to a rabbit who was getting perilously close to a busy, nearby highway and an early demise, should it have hopped out onto the roadway. Kirk was just getting home from work in Philadelphia and first saw the "white, clearly domesticated rabbit" when she was arriving back at her car. "[The rabbit] was by the stairs leading down from the street. I knew I couldn't just leave her so close to the road and the train tracks," she recalled. "I approached the rabbit and was able to get close to her." It was at that point that she dialed her husband, Richard, to describe the situation. “She asked me to drive over to help so I loaded up my car with a net, a carrier we use for our cat normally, some carrots and handling gloves,” Richard explained. When Richard arrived at the train station in Cherry Hill's Woodcrest section, the Mt. Laurel couple worked in tandem on the hill facing I-295. “We knew we just couldn’t leave her. We grew to love her pretty quickly. I looked at Rachel and said, ‘We have a pet rabbit now, don’t we?’"
“After nearly an hour, Rachel caught her and we gently put her into the carrier,” Richard said, giving credit where it was clearly due. "It took a lot of patience and luck, but I was eventually able to net her, and we took her home," said Rachel. It heartened the Kirks to see the attention drawn to said rabbit via the #SaveTheBunny hashtag on Twitter. 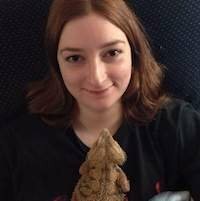 Rachel Kirk, pictured with pet bearded dragon Yig, was commuting home from Philadelphia after see saw a wayward rabbit near the Woodcrest PATCO station. Richard had never had a pet rabbit, but Rachel and her family had several when she was younger. Though they have a cat, bearded dragon and fish at home, the Kirks planned to place the rabbit they saved in a shelter or with a rescue organization. 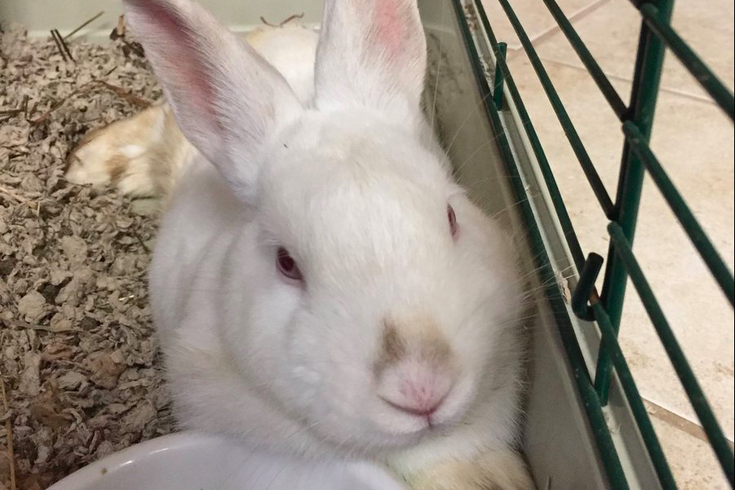 On Thursday night, they loaded up the car and headed to a shelter about 45 minutes away from where the rabbit was found. It came time to say goodbye when a worker there loaded the rabbit into a cage. The Kirks walked outside, but had a change of heart. “We went back in, apologized to the very kind person that had offered to take her in, but we knew we couldn’t leave her," he said. "We brought her home." Rachel agreed that it just didn't feel right to part ways. "We tried not to get too attached, but as she settled in, her sweet personality came out and we fell in love with her," she said, noting that they'll take their new pet to the vet on Monday. "Despite all she had been through surviving outside, she's extremely calm and good-natured. "We just decided we couldn't give her up, and she now has a loving home for life."